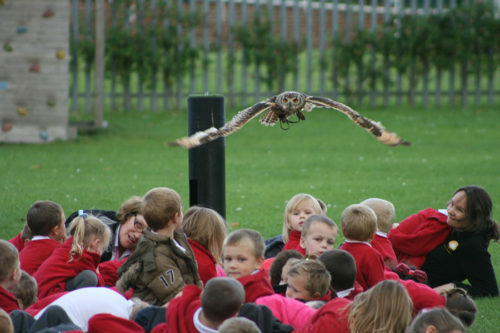 Since 2005 Sky Birds Of Prey has been visiting schools and clubs providing educational visits and flying displays. We believe that education is a key part of conservation. Through our experience, The more information you are given about the work we do and the importance of looking after the birds of prey we have here, then the greater chance we have of you being inspired to protect them. By working with teachers and schools, we’ve been able to create a number of tailored education packages to suit all key stages. Combining Science – Habitats – The Food Chain – The Environment – Flight – Predation – Pollution. Within our visits we provide an interactive Flying display covering the science behind birds of prey within the British Isles. Our flying displays have been specially crafted over the many years. By being able to see our birds in action as they swoop and gracefully fly close to your head, you’ll get a better understanding of their role in their natural habitat. We combine this with a fun, informative live commentary which explains what the birds are doing and why. We are also able to complete these visits inside or out and complete the flying displays inside or out if the weather lets us down. This combination, delivered to your school or club, Is able to complement your term’s topics and work with the National Curriculum covering all Key Stages.